After 82 blog posts, I have never re-posted or written a post about another blogger’s post. However, today (actually earlier this month, but I never completed the post) I saw a post that I know took 4 hours to write, and is very informative. Also it gives me a chance to introduce Realtor Jeff Royce. He has one of the best blogs around for Fairfax Homes (that was for Google Juice), and after 11 years in the business he just came over to FranklyRealty.com from Re/Max. Welcome Jeff. He also got a Trulia “Best Answer” of the week award (out of hundreds of Realtors), so he knows his stuff. Anyhow, back to his post, he talks about finding homes near 1 mile from the Metro. 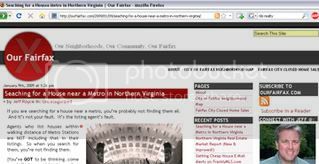 On FranklyMLS.com we allow you to search the public Realtor remarks (one of the only sites that let you do this). Here is an example: Arlington Metro. However Jeff makes a point that data is only as good as the Realtor that puts it in. He found that for around Pentagon City Metro, only 65% of homes within a mile of the metro, also put the word “Metro” in the remarks. 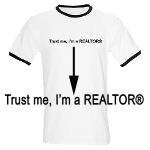 There is also another way a Realtor can enter in Metro data. They can click the “Within 1 Mile of Metro” when they are entering in their listing. However only 45% of agents do that (shame, shame). And yes, some will JUST check the box and not put it in remarks. So now (due to Jeff’s suggestion) FranklyMLS.com now will search BOTH the public Realtor remarks AND the Realtor checkbox when you search for the word Metro. But it still isn’t perfect. Some agents leave off both. In that case only a map search can find homes within a mile. FranklyMLS.com doesn’t do that (the focus is to have a super fast data driven site), but maybe it will at some point. Jeff gives examples of the back end Realtor MLS access “Matrix” database that lets him create circles, multiple polygraphs etc. To the right are 10 areas in one search. Can you see the smile? 1) Buy homes with no photos. See Photoless Listings, save $15,000 (just yesterday I was making fun of my friend Brian for a no-photo home that I sent him a link to. He said “F-that.” To which I sent him the above link. 2) Don’t be too specific when searching. Many bank owned listings and short sales will forget to check boxes like “garage” so if you search only for homes with garages… you might miss the best stuff. Also I created a new FranklyMLS.com new features blog so you can learn about each little tweak (like Minimum price, faster cell mode for full listings, Request Wiki Photos, Tag A Hood and LIVE Realtor Chat!). Hey Frank, Just a reader in DC who loves the site and the blog here. I think you may have meant “polygons”, not “polygraphs”, although I’ve been known to be wrong on occasion. Keep up the great work; FranklyMLS is a MUCH better search site than the other ones I’ve used in my current house search. Frank; Great blog and great information. I will stop back often to read and comment. I agree with your comment regarding poorly marketed homes. The buyers can get a bargain. wow this is something that would really make a site stand out. i frequently search ‘vre’, is there a checkbox for that too? GT…I’m planning to set up a geographic search for VRE stations which will be better than searching for VRE because of the many agents that don’t include that info. Go to ourfairfax.com and subscribe to posts to make sure you get it. I should get it done by next week sometime.